Students study art history is sixth, seventh and eighth grades. This multidisciplinary program encourages students to view art as visual history, as primary source records of the past and present cultures that have created it. Students examine examples of Western and Non-Western painting, sculpture, and architecture in order to broaden their understanding and appreciation of the global commonality and diversity of art, and the peoples who create it. Of equal importance, students develop high level critical thinking, as they learn to analyze, synthesize, and evaluate works of art. These visual literacy skills are a vital necessity in a world that constantly deluges them with photographs, advertising, videos, and graphic arts of all kinds. Art history classes have an interdisciplinary component that includes cross-curricular activities among English, history; math, religious studies, art, and music classes. Field trips to local and San Francisco Bay Area museums, art shows, architectural monuments, and private collections enhance the students personal experience of art. The magic of cave paintings, the mysterious construction of Stonehenge, and the yet undiscovered treasures of the First Emperor’s tomb are just a few of the exciting topics students explore in sixth grade. As a compliment to their ancient history class, students examine the forms and functions of the art and architecture of prehistoric cultures and the great ancient civilizations of the world: Egypt, Mesopotamia, China, the Aegean and Greece. In doing so, they begin to develop the art history skills of visual analysis, posing insightful questions, formulating opinions based on observable details, critical reading and writing, open-mindedness and creativity. The Pantheon in Rome, Istanbul's Hagia Sophia, the Great Mosque of Mecca, the ruins of Great Zimbabwe, the gothic Cathedral of Chartres, and St Peter’s Basilica are just a few of the architectural wonders students explore in seventh grade as the art history program expands to include a wider variety of western and non-western civilizations. Students develop their critical thinking skills further as they begin to compare and contrast art works, artist and styles...How does Renaissance sculpture differ from that of ancient Rome? And as they begin to study the secret life of paintings, the hidden symbols... Why does Leonardo divide the Last Supper into four groups of three figures? 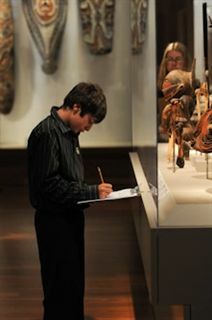 Students complete a final examination in San Francisco museums. By eighth grade, students have developed keen aesthetic sensibilities and eagerly express their individual appreciations or critical assessments of works of art based on art historical research, visual perceptions and personal preferences. Students examine the role of children’s portraiture in the American colonies, debate who was the greatest Baroque artists, create a short story based on a Romantic period painting, determine whether a Monet or a Van gogh should bring the highest auction price, and consider which artist had the greatest impact on Modern art, Picasso or Matisse. The students’ capstone project is the creation of a virtual art museum on a theme of their choice.